Ohio Northern University has their yearbooks available online and I'm here to let you know about it. Ohio Northern are a pretty old football program. The ONU Polar Bears started playing football in 1893 winning their only game 24-0 over some school called Deming-Freeman. Today Ohio Northern plays division three football in the history rich and rivalry-laden (PDF) Ohio Athletic Conference. Some relevant historical data can be found on Ohio Northern's 2010 football media guide (PDF). 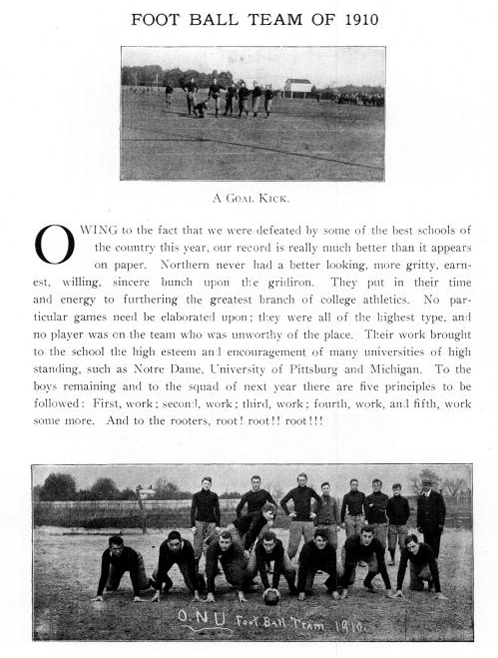 Ohio Northern played Pitt in 1907, in 1908 they played Notre Dame and by 1910 had Pitt, Notre Dame and Michigan all on that year's schedule. In terms of history, Ohio Northern has another footnote - they were the team to snap Mount Union's ridiculous 110 game win streak. The media guide works fine, but the PDF interface for the Northern yearbooks is clunky at best. You have to appreciate the effort to get these online and by the looks of things the scans look pretty nice so maybe in the future they can commute these great yearbooks to a more functional platform. No matter the aesthetics of the program, this yearbook collection is an amazing historical source and a treasure to have available for free online. There it is: the Ohio Northern Northern; another Wednesday, another solid football yearbook.